This is an update to the Potions plugin that greatly extends their functionality, streamlines what they do, and also indicates things better. 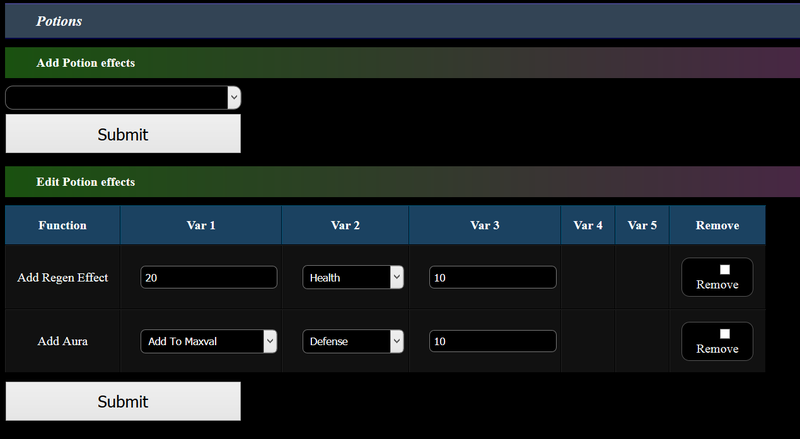 Status Effects and Potion effects have been condensed into a general "Effects" block. This block actually tells you what the potion does as well, indicating green for adding stuff and red for removing stuff. Here's where you can edit the actual functions. A *LOT* of functions are supported, including some things not supported in other systems (poison, regen, manipulating auras). First choose the function you want, and click submit. Then you can actually pick the aura effects. They're in the same order that they are in in the Auras panel (I should really document them sometime). There's a way of making the change affect the boxes that pop up but that would require waaaaaaay too much infrastructure work, so for now just click submit to get the aura boxes to appear. Potions from the old system should be migrated over correctly. If you see any issues there let me know. I've tested some of the functions, but not all. Aura functions are most likely to be buggy (but hopefully not). If you see any issues let me know. 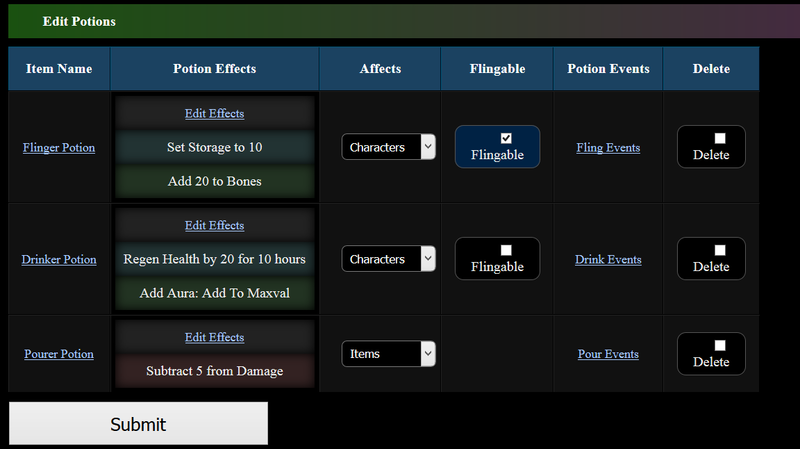 Much like the Events and Conditions systems, I can create new potion effects very easily. Let me know if you want anything else, although remember you can always just use the Events system as well. @Moonray: Also this is probably going to be a verrrrrry productive night.